Industrial production – based on working-day adjusted data – rose by only 2.9% year on year in April, another disappointment following retail data in 2Q18. When we consider the raw data, industrial output showed a remarkable 7.8% YoY increase because there were two more work days in this period. The significant difference between the raw and the adjusted data suggests that the level of capacity utilisation is high. 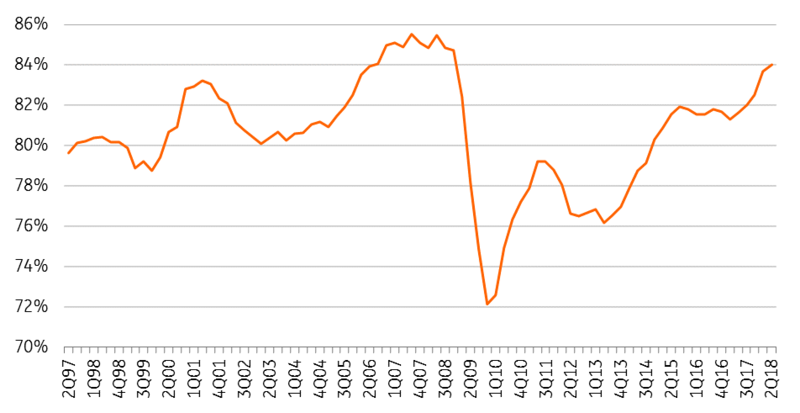 According to the Eurostat measure, the level of capacity utilisation is around 85%, very close to its historical peak. Taking into consideration the first four months of 2018, we saw some month-by-month volatility in the growth rates, but the volume of industrial production is roughly the same (108-109% of the monthly average of 2015). It seems that companies are hitting capacity constraints and unable to elevate production levels. We are still waiting for new capacities to show up, which might happen in 2H18. 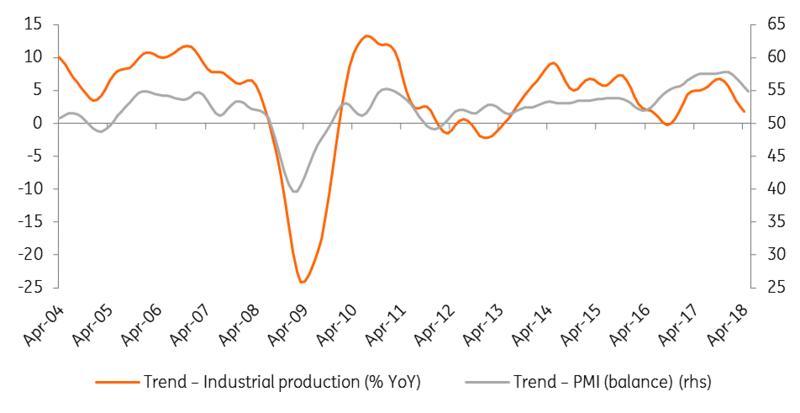 Soft indicators like business confidence and PMIs are showing further a deceleration, thus capacity constraints are clearly restraining industrial performance. According to the statistical office, output in the manufacturing sector was up in all segments. In our view, this means that recent weakness is not due to a unique reason in a specific sector but rather shows a comprehensive and general problem, supporting our view on the limitations in production.